Partial evaluation (PE) is a powerful and general program optimization technique with many successful applications. However, it has never been investigated in the context of expressive rule-based languages like Maude, CafeOBJ, OBJ, ASF+SDF, and ELAN, which support: rich type structures with sorts, subsorts and overloading; and equational rewriting modulo axioms such as commutativity, associativity–commutativity, and associativity–commutativity–identity. In this paper, we illustrate the key concepts by showing how they apply to partial evaluation of expressive rule-based programs written in Maude. Our partial evaluation scheme is based on an automatic unfolding algorithm that computes term variants and relies on equational least general generalization for ensuring global termination. 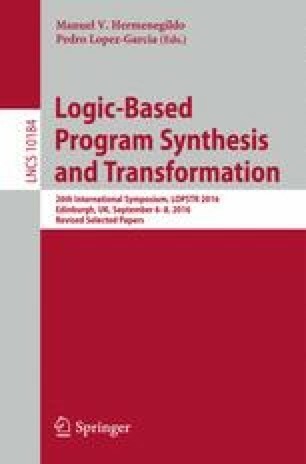 We demonstrate the use of the resulting partial evaluator for program optimization on several examples where it shows significant speed-ups. This work has been partially supported by the EU (FEDER) and the Spanish MINECO under grants TIN 2015-69175-C4-1-R and TIN 2013-45732-C4-1-P, and by Generalitat Valenciana under grant PROMETEOII/2015/013, and by NSF grant CNS-1319109. Angel Cuenca-Ortega has been supported by the SENESCYT, Ecuador (scholarship program 2013).